Delmer's is known for its Milking trolleys as they are the easiest automatic milking solutions; it's a wheel-supported chassis which is equipped with the milking system. Proper grooming is vital and works to contribute in total hygiene & welfare of your animals.When Regular brushing the skin, it helps to keep animals in good condition and protect it against external factors. 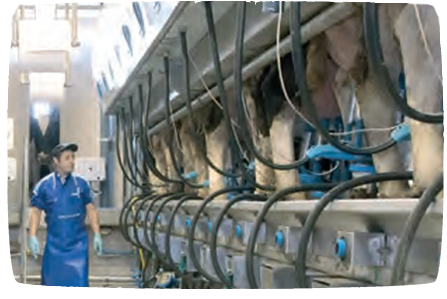 Effective cleaning and sanitisation of all equipment that comes in contact with milk and consistent cleaning of the milking parlour environment are crucial steps in producing healthy and high-quality milk. One of the main factors determining the effectiveness of these processes is the right choice of detergent and its proper use. Cooling fresh milk just after milking, is a fundamental process for preserving milk quality. Whole Milk cooling aims in avoiding the development of microorganisms in milk while reducing the phenomena of fat and protein alterations. Delmer is a dynamic company with strong traditions and a clear vision of the future in the international agricultural market.